Entry to Prague's biggest post office in Jindrisska street. It is open 24 hours a day and is very beautiful inside, you ought to see. 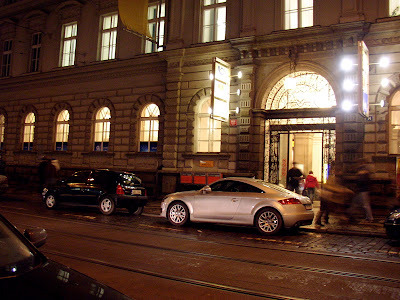 It is very close to Wenceslas square and as you can't miss Wenceslas square while in Prague, you can visit this post office, too. Jindrisska street crosses the square just in the middle.